The 2013-2014 EContent 100 list also includes Google, Apple, Amazon, LinkedIn, Facebook, and others who are important players the digital content industry. “This is great for the industry, and exciting for those of us who cover the space,” Theresa Cramer, editor of EContent. 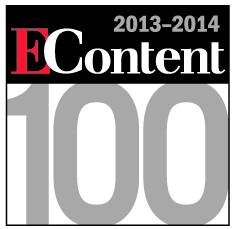 The EContent 100 List can be seen online at www.econtentmag.com and in the December 2013 issue of EContent.